Puris recipe by sajida at DesiRecipes.com. 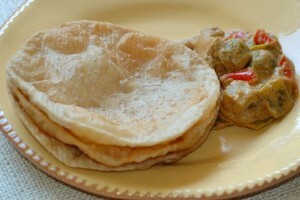 A fried snack bread eaten with pickles, daals, halwa, chanay and other curries and usually serves in breakfast or parties. Pour three tablespoons of cooking oil in plain flour and rub it with hand. Now add salt , baking soda and crushed cumin seeds . Then pour milk and make a smooth dough. Cover the dough with a moist cloth and leave aside for ten minutes. Apply little warm cooking oil into your palms and make small balls (pairhas) with the dough. Now roll out the balls into small sized rotis and deep fry them in cooking oil. There are 3 comment(s) for this recipe.